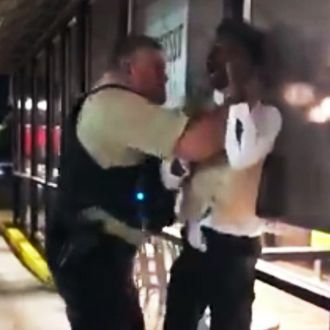 This week, yet another report emerged of a black customer’s violent arrest at a Waffle House — the second to go viral since April 22. As video from this most recent incident shows, customer Anthony Wall got manhandled by cops at a Waffle House in Warsaw, North Carolina, last Saturday after he got into an argument with staff. The officer, Frank Moss, put 22-year-old Wall in a choke hold and body-slammed him to the ground, before arresting him on charges of disorderly conduct and resisting arrest. Gerald Griggs, a civil-rights activist in Atlanta, where Waffle House is based, says that all of these recurring incidents are “an epidemic of the culture around Waffle House.” The company is “insensitive to people of color and it needs to be addressed immediately,” he argues, and also tells the Atlanta Journal-Constitution that people should engage in some form of “economic disruption” to send Waffle House a message. I wanna be clear on something. I'm done with your corporation. Permanently. I'm asking my followers to just be done with you too. To give you an idea of the sheer size of Officer Frank Moss, that's him on the far right of this photo. He has been brutalizing people in North Carolina for years on end. Last night, the NAACP Legal Defense Fund put out its own statement calling Moss’s actions “grossly inappropriate” and demanding the Warsaw Police Department and DA to release any body-cam footage that was obtained, plus audio of the police call. Waffle House has responded that it prides itself on being a diverse and welcoming diner chain, as “anybody knows who has eaten with us.” The only problem, according to critics, is that lots of black people who’ve recently patronized the chain would strongly disagree. The same night of the tragic shooting at a Nashville location, a black woman 400 miles south in Alabama was being violently arrested after disputing a store’s charge for to-go plasticware. In video footage, police can be seen choking her as well, and her shirt rips off in the fight.